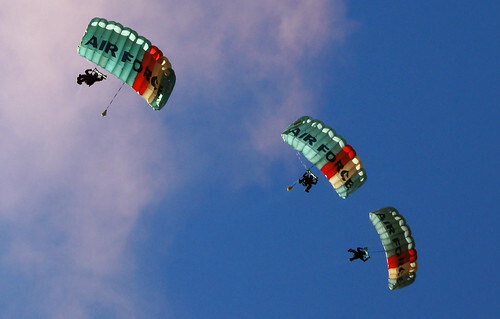 One of the most visual aspects of the Parachute Training and Support Unit is the displays carried out by the Air Force Parachute display team called "Kiwi Blue"
Comprising members of the staff of PTSU the team performs at airshows, open days and other events where the Air Force participates. The team has carried out displays overseas in Australia and the United Kingdom, jumping alongside their compatriots of the host countries. The use of smoke by the descending parachute team provides spectacular viewing, and on many jumps a large New Zealand flag is attached below one of the jumpers.